In stock in select colors like Lever, Nero, White & Savannah (others are special order). Call or chat for fastest shipping models. 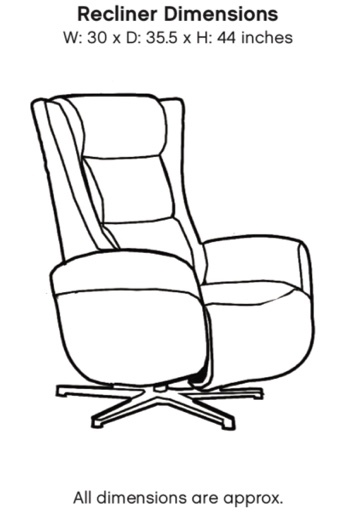 Himolla Gert Recliner with Integrated Footrest- German Engineering at an Amazing Price! The GERT Recliner- Where quality German engineering begins. A super-relaxing chair that gives you the technology to swivel and adjust to whatever suits your mood. The convenient, integrated footrest, perfectly-aligned headrest and the manual gas back are designed to help you effortlessly relax and unwind. Covered with some of the world's most luxurious leathers, you'll be amazed at just how comfortable you can become after a hard days work! European styling delivers amazing design. Manual gas back- Independent adjustment. Adjustable backrest, up to lying position. Smooth recline and swivel action. Firm and solid, polished stainless steel base. Fantastic German engineering at a great price! All models have 3 standard functions: Articulating headrests, reclining backs and integrated footstools. Recliner frames are completed by hand. Wood bases are crafted from solid European beech wood (one of the sturdiest woods in the world). Frames are glued, bolted and stapled to insure maximum durability. Superlastic Cold Cured Foam (3.4 density memory foam). No-Sag suspension springs keep you supported for many years. Himolla Recliners are tested for stability for weights up to 285 lbs. Chairs and sofas all have active lumbar support and ergonomics for proper, healthy blood flow. All models feature top grain leathers from Italy and Brazil. Choose from an amazing selection of wood finishes and multiple grades of leather in many color options. 5 year Himolla warranty that covers interior cushion, frame structure (fixed parts) and leather against fading and color fastness. The balance of the parts are covered for 2 years. Expect many, many years of worry-free comfort and healthy back support. HIMOLLA WARRANTY- LIMITED 5-YEAR GUARANTEE Himolla offers a 5-year guarantee on all of the following parts: Padding, sub-springing and interiors springing. Frame and non-moving parts. Durability and resistance properties of their Longline leather. Cold cure moulded seat cushions. Great price- Very comfortable recliner, Love it! The neck rest is very comfy, it reclines really far back, and the foot rest that comes out when you recline is very nice. Great price for a chair from Germany! Finally a European chair I could afford! I've been looking for what seems like forever. I finally picked out a Gert recliner and I love it!